Let Russell and Carl float some Disney magic and adventure into your day with these fun crafts and printables. -- Put together this fun and easy 3D character of Russell and keep him close by to always remind you that adventure is everywhere! -- Behind his gruff exterior, Carl hides a heart of gold. Now you can have your own 3D Carl character to take on an adventure! -- Watch Carl and Russell float off on their adventure with your very own 3D balloon-propelled house. -- Make summer reading more fun with these colorful bookmarks. Russell and Carl will cheer you on every page of the way! -- Let your little brothers and sisters know your room is off-limits with this doggone intimidating door hanger. Grrrrrrr. -- Keep track of your summer adventures! When you complete a task in the book, glue or tape the badge to the page and write a little bit about what you did. -- With these finger puppet crafts, you can recreate the story of UP or use your imagination to tell a story of your own. These puppets are easy to make, and require only basic craft supplies that you may already have around the house. 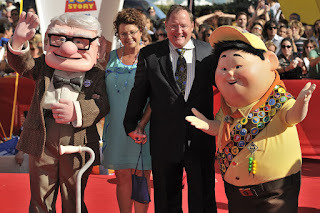 • Embark on a journey with Carl and Russell at the official UP site! -- About the film, characters, gallery, videos, downloads, games. Requested Sept 19/08 - will post back when received. I have a dog & live in Canada, so I asked for a dog food sample, so we'll see if they fill my request.